Panic-grasses are bewildering in their profusion and their variety. 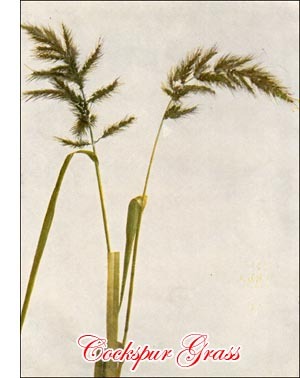 No other genus of the grass family offers such a number of species in the Eastern States. Abundant by waysides, in old fields, and on river banks, Panic-grasses are equally common on sandy soils near the coast. Diverse in form, low species, often less than a foot in height, are like miniature bushes; slender ones are lost amid the surrounding taller growth; broad-leaved Panicgrasses, shoulder-high, form dense green thickets by our roadsides; stout species, burned by a hot sun to purple and copper colour, grow in clumps on the beaches, and with long rootstocks bind the wind-blown sands; and a more delicate Panic-grass bearing great flowering-heads of long, hair-like branches is a common tumbleweed in many states. In some species the pyramidal flowering-heads seem loaded with cereal-like grain, so large are the blossoms; in others the flowers are few and far apart; while still others bear small blossoms, abundant and crowded. It is a comparatively easy matter to refer each Panic-grass to the genus Panicum; the spikelets with their shining, porcelain-like flowering scales are so characteristic of the genus that they form an easily distinguished feature, but even with the microscope it is often difficult to determine those of the several species that closely resemble one another. Cockspur Grass, formerly included in this genus, which it closely resembles, save in its awn-pointed scales, is common in cultivated lands, where its coarse, erect panicles blossom soon after midsummer. The plant varies greatly, sometimes clothing the flowering-heads in long awns, and again appearing practically awnless. In rich soil the plants are often six feet tall, but in low grounds near thickets and brooks this grass sometimes blooms when it is less than six inches in height. Old Witch-grass (Panicum capillare), is a beautiful weed of dry soil and is easily recognized, since, even to the most superficial observer, it is unlike any other grass of late summer. The large, vet delicate, flowering-heads, composed of innumerable fine branches, are soft and silky when they first break from the enclosing sheaths; later, when the flowers bloom and the seeds ripen, the panicles are widely open and stiff, and, soon broken by the wind, are blown as tumble-weeds across the fields to scatter their seeds and give them to the care of another year. Small members of the genus are common by roadsides and in fields, where in short flowering-heads of green and purple spikelets Panic-grasses bloom from spring until autumn. Among those most commonly found are the Forked Panic-grass (Panicum dicho- tomum) bearing short, spreading leaves on slender, wiry stems which support scantily flowered panicles; Starved Panic-grass (Panicum depauperatum) recognized by its narrow, erect leaves which often equal the stem in height; the several species of Hairy Panic-grass clothed in short, white hairs; Scribner's Panic-grass, with short, coarse leaves, rough on the margins, and borne on hairy sheaths, the panicles composed of large, plump flowers; Round-fruited Panic-grass (Panicum sphaerocarpon) bearing many flowered, purple panicles, hairy-margined sheaths, and broad, rough-edged leaves; Small-fruited Panic-grass (Panicum microcarpon) with longer, oblong panicles of many tiny flowers; and Porter's Panic-grass (Panicum Boscii) bearing a few large spikelets, the nodes of the stems barbed with soft hairs, and the sheaths and broad leaves clothed in soft pubescence. The larger Panic-grasses do not begin to bloom until midsummer or later. Many of these are common in damp soil. The Large-fruited Panic-grass (Panicum latifolium) bears pyramidal panicles of large, seed-like spikelets; in Hispid Panic-grass, which, like the preceding species, borders with leafy stems our wayside thickets, the spikelets are more oblong and the sheaths are roughened with short, stiff hairs. Spreading Panic-grass (Panicum dichotomiflorum) branches abundantly, spreading over the surface of the ground, and the smooth, stout stems and flattened sheaths are surmounted by flowering-heads which are often a foot or more in length. with vivid-coloured anthers and stigmas. Nor is the above a complete list of the Panicgrasses that bloom in Eastern States: in some localities nearly a score of species may be gathered within the radius of a mile. Brilliant tints are given to many, purple and reddish brown colour the green spikelets; orange and terra-cotta tinge the anthers of some, purple the anthers of others. Often in the smaller species a few leaves are dyed in crimson, and in the majority of the Panic-grasses the feathery stigmas are of deep purple.